The heat and humidity of summer can take a toll on wood decking, especially if you have trees that shed leaves which can become moldy. September is a great time to tackle this chore before wet fall days begin. The first thing you need to do is remove everything from the deck or porch. You can use a leaf blower or a large broom to get rid of any build-up of dirt or debris. Find a large bucket and first put in a small amount of dish soap, then fill with warm water. Next comes the elbow grease as you use a stiff brush to scrub down the wood decking. 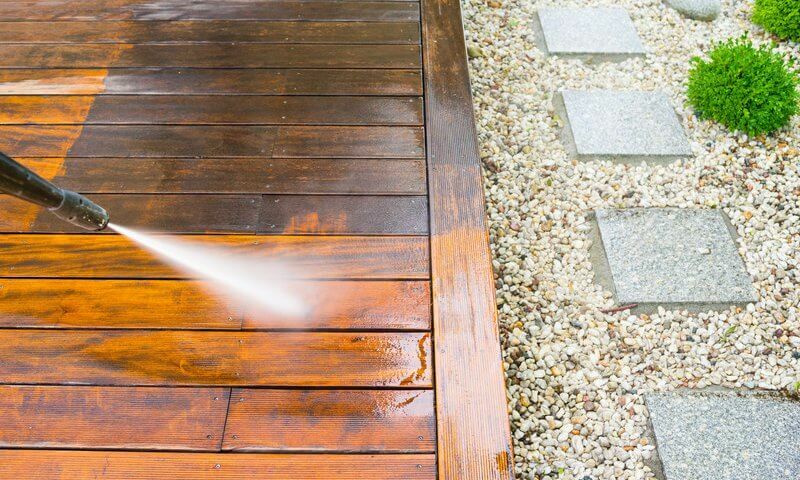 It’s important to get all the soapy suds off the wood so rinse the decking with a hose that has a nozzle sprayer. Let the decking dry out completely. The end of a busy season is a good time to use a wood sealer to protect it from a harsh winter. When spring rolls around, all you will need to do is freshen up a bit and let the grilling begin. Just like your rugs, furniture cushions shouldn’t remain outside all winter. Wash or dry clean the fabric covers (hand wipe if necessary) and store them away in a dry location. Some time away from the elements of weather will allow them some breathing time for a few months. If you have outdoor string lights you want them to add charm to your yard for many years. Even though some manufacturers say lights are winter hardy, it’s a safer environment indoors. Prolonged cold wind and other harsh elements can lead to damaged wiring and bulbs. Carefully take them down and box them up until spring. You may plan to tough out the colder climate and continue to grill outdoors, but it’s still a good idea to give your unit a complete cleaning. All that warm weather cooking has surely caused a buildup of greasy residue. Dismantle all removable pieces and scrub, scrub, scrub. Check every element for wear and damage. For gas grills, once outdoor cooking is definitely concluded, make sure the propane tank is off and your supply line is disconnected. Charcoal grills can be covered for extra protection and brought closer to the house or placed inside a garage. It’s the end of the season so out with the junk. Do a full inventory of everything stored away in the garage and get rid of any extraneous items. Take all storage bins and lightweight items out onto the driveway and do a meticulous sweep of the garage interior. Knock down all cobwebs and wash the windows. If you have miscellaneous items lying around that need to be kept, buy some stackable storage bins. Check all lights and wiring to make sure everything is in good working order and there are no frayed wires. Any flammable liquids that aren’t essential for the winter should be disposed of. All gardening tools should be washed off and stored for the season. Some pruners and shears might benefit from a light oiling. Does the garage look good enough to eat in? If so, great job! By now you should be feeling really good about yourself and your hard work. Does everything look clean and put in its place? Think ahead to spring and appreciate how you’re going to feel come March when you fully realize the benefits of your labor. Enjoy the satisfaction of a job well done, but don’t get too cocky because there are still flower bulbs that need to be planted!